Swallowing is a multisensory phenomenon of relaying timely, coordinated sensations of the oropharyngeal and esophageal cavity to the medulla oblongata. Taste, texture, and chemesthetic sensations at the region of oral mucosa and taste buds congregate to trigger the swallow reflex. Clinicians and researchers of deglutition science concur that oromucosal receptors differentially react to intraoral bolus perceptions, resulting in varied neuromuscular excitement. While sweet taste tends to promote swallow capacity (SC), on the contrary, sour stimuli decrease SC. Similarly, carbonated thin liquids (CTL) also have the potential to vary swallowing by robustly stimulating the sensory pathways. CTL or carbonation is the by-product of the sodium bicarbonate dissolved in distilled water. Virtually, there exists little experimental evidence of using CTL to heighten intraoral sensory perception. Recently, Sdravou et al. examined differences in oropharyngeal swallow for CTL and NCTL in neurogenic dysphagic population. The results revealed decreased penetration and aspiration when 5 and 10 ml CTLs were ingested. Similarly, in another study on children with dysphagia, CTL swallow evidenced decreased incidences of liquid spill-over and laryngeal penetration in comparison to NCTL. However, no differences were noted for oral transition, pharyngeal retention, and aspiration signs when CTL was swallowed by 14 subjects having dysphagia following stroke. On the whole, we can arrive at the premise there exists no one-sided conclusion that sheds light upon effectiveness of using CTL. This necessitates to pool in more scientifically sound evidences, both in normal and dysphagic population. The primary goal of every deglutitionist is to facilitate oromotor bolus control to attain safe swallow while meeting bodily fluid and metabolic needs. In this line of treatment, using compensatory strategy is universally popular. Most sought after strategies include posture modifications, altering bolus characteristics, and/or adopting sensory stimulation techniques. Over the years, CTL has gained ground to be one among the forefront strategy in enhancing sensory stimulations among oropharyngeal dysphagic populations. However, the conclusions drawn from those remain questionable and feeble as the reports were retrospective treatment outcomes in subjects with dysphagia due to mixed etiology. The same authors also highlighted that randomized control trials must be performed to holistically understand the effectiveness of CTL for positive swallow outcomes. On the continuum, majority of the clinical works have focused on using sour liquids for oral sensory stimulation. Sour taste even though is edible has been practiced with caution in the recent years. The outcome of a study on dysphagic population revealed that sour taste is unpalatable and difficult to adopt in daily meals., Hence, dysphagia practitioners considered commercially accessible carbonated drinks in swallowing therapy. The combination of high pleasantness value and use of carbonated agent in refreshment drinks have made researchers explore differences in CTL swallow among normal and dysphagia population. Hence, the primary goal of the study is to investigate and report if there are any differences in swallow for CTL in comparison to non-CTLs (NCTLs) in healthy young adults. A cross-sectional comparative study design was adopted for the data collection. Thirty age- and gender-matched healthy young adults within the age range of 18–24 (mean age = 22.3) years participated in the study. Oral consent was obtained from each participant before carrying out any further investigations. Sensory-motor problems, neurological disorders, and upper respiratory tract infections were ruled out by case history. None of the participants had a history of excision performed on their oral and/or pharyngeal structures. Swallow was deemed safe as per Eating Assessment Tool-10. The proposed tool consists of ten sensitive questions that screen for patients with risk for dysphagia. Deglutition was deemed intact if the participants obtained a score of <3, which is as per the tools norm. In addition, clinical signs of cognitive impairment were ruled out by administering Mini–Mental Status Examination. Participants with score >24 were only included for further investigations. The stimuli to assess swallow were broadly classified under two categories, i.e., CTL and NCTL. 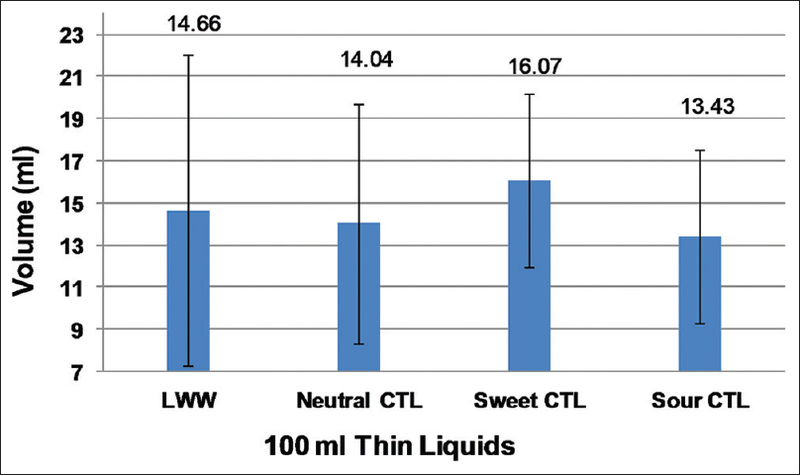 Within CTL, the study adopted neutral, sweet, and sour taste. Commercially available packed soda was used for neutral CTL, whose composition was by-product of sodium bicarbonate dissolved in lukewarm water. 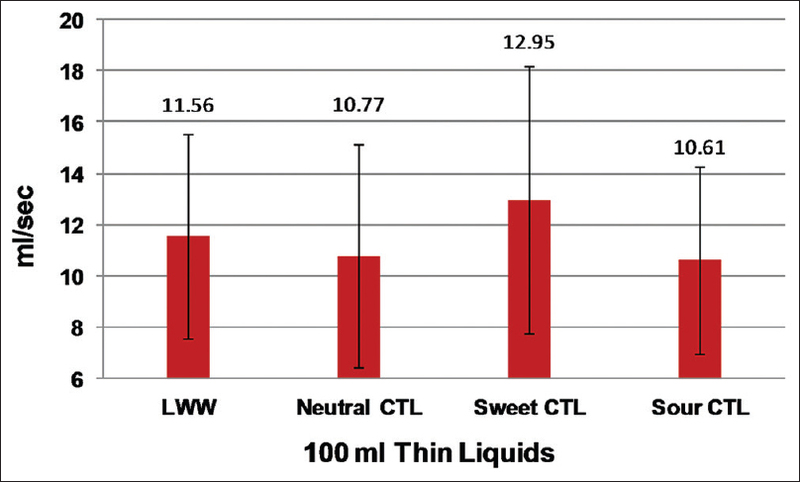 To obtain different taste, sucrose and citric acid were mixed in neutral CTL to serve as tastings for sweet and sour CTL, respectively. Selection of agents to obtain appropriate tastings is in consonance with previous works on taste perception., For NCTL, lukewarm water at room temperature was used. Collectively, a total of four types of thin liquids under lukewarm temperature condition were subjected to testing. Palatability of the neutral CTL was measured using Quartermaster Hedonic Scale. Participants were instructed to rate the CTL from 1 to 5 based on their likeness toward the taste, as shown in [Table 1]. Directions were given to Score 1 for “like extremely” and Score 5 for “dislike extremely.” The rating was duly marked after the subjects ingested CTL. They were instructed to compare the taste with NCTL. Likewise, since the experiment used tastings, to monitor no overpowering of taste, all participants estimated the taste threshold over a 0–10 visual analog scale. A tick against minima 0 was suggestive of below the subjects' taste preference while maxima 10 indicated above the subjects' taste preference. Participants were seated on a chair with backrest and arm rest with the foot placed firm on ground. 100 ml thin liquids were given to each participant in a 120 ml capacity throwaway cup. Clear directive was given to continuously ingest the thin liquids without stoppage at their natural pace. Participants were also instructed to perform the task without oral spillage and/or residue in the cup. These directives are in consonance with previous works on sequential swallow.,, Concurrently, hyolaryngeal movement and total time taken to swallow were duly noted by the clinician as per timed test of swallow standards. One hyolaryngeal elevation and subsequent depression were accounted as one hyolaryngeal movement. The total time taken was calculated using digital stopwatch. The timings commenced with the rim of cup touching the lower lip and ceased with the cup withdrawal. Using these two data, three offline indices, namely, volume/swallow (V/S), time/swallow (T/S), and SC were calculated. The mathematical formula used in the data analysis of swallow indices is mentioned below. Volume/swallow was calculated by dividing the volume of thin liquid swallowed and number of hyolaryngeal excursion. It was derived by dividing total swallow time and number of hyolaryngeal excursion. It was calculated by dividing volume of thin liquid swallowed and total swallow time. Each participant ingested two types of thin liquid consistency with 30 min inter swallow time. Collectively, data collection was performed across 2 days. The mean value obtained for the Quartermaster Hedonic Scale was 3.1, suggestive of carbonated sweet water (CSW) as neither like nor dislike. The rating of tasting for sweet and sour was rated by subjects as 5.9 and 5.66, respectively. These scores are indicative that taste is well within preferred range and no overpowering of taste would have resulted in the test results. Based on the mean values obtained by descriptive statistics, the study noted differences in swallow indices between CTL and NCTL. 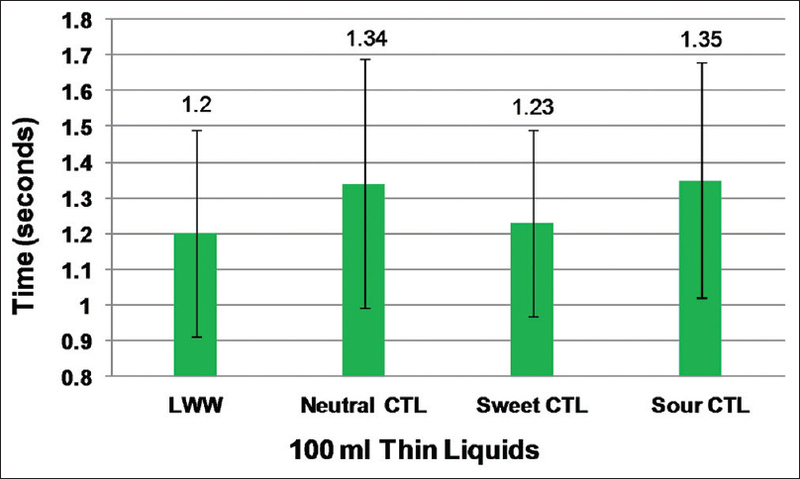 In V/S, sweet CTL had maximum volume intake followed by NCTL, neutral CTL, and sour CTL. Whereas in the temporal parameter T/S, the shortest time taken to swallow was by NCTL, sweet CTL, and neutral CTL and longest was by sour NCTL. Finally, SC indices were highest for sweet CTL followed by NCTL, neutral CTL, and sour CTL. The mean values with standard deviations are depicted in [Figure 1], [Figure 2], [Figure 3]. Repeated measures of analysis of variance were administered to note the statistical difference between CTL and NCTL at 95% confidence level. Statistical results revealed no statistically significant difference between CTL and NCTL. The present study was taken up to measure differences in CTL swallow among healthy young adults. Based on the data analysis, results of the study suggest the clinical difference between CTL and NCTL swallow. These notable changes can be attributed to the variations in the intraoral sensory perception. Physiologically, at the oral cavity region, chemesthetic agents are governed by the trigeminal nerve in conjunction with the vagus and glossopharyngeal nerve endings. These afferent nerves sensitize the swallow threshold at the peripheral level, i.e., oral mucosa, pharyngeal wall, and faucal pillars, whereas subsequently increasing the neural excitation at medulla oblongata resulting in a quicker and stronger trigger of swallow reflex. This afferent mechanism would have resulted in higher V/S, decreased T/S, and increased SC. Several experiments performed on patient taste perception have concluded that neutral CTL mimics sour taste efferent response. Furthermore, neutral CTL's gustatory property increases intraoral mechanical stimulation by the dissemination of free protons from the sodium bicarbonate chemical when it contacts oral mucosa. As a result, multiple nerve endings are stimulated, leading to increased lingua-palatal effort. This is in support of the present study findings, i.e., increased T/S for neutral and sour CTL. Moreover, experimental reports indicate sour stimuli to be perceived with lower hedonic value. This view is probably why sour CTL has the least V/S and SC. On the contrary, sweet CTL is evidenced to have the highest hedonic value as it contains glucose contents necessary for bodily metabolism. Supportive to this, we humans are primed for higher intake of sweet taste. Combination of these viewpoints converges at increased V/S in the study participants. The present study attempted to note the difference in CTL and NCTL using the 100 ml water test in healthy young adults. Data suggest that although there was no statistically significant difference, clinical results reveal that sweet CTL promotes swallow performance while sour CTL inhibits SC. These findings have practical implications in dysphagia practise, specifically to heighten the intraoral sensory experience. Data of the study also can serve as a reference for clinical measurement of volume for one CTL swallow attempt. Further studies are warranted administering the study on a larger age range and clinical population. Green BG, Alvarez-Reeves M, George P, Akirav C. Chemesthesis and taste: Evidence of independent processing of sensation intensity. Physiol Behav 2005;86:526-37. Chee C, Arshad S, Singh S, Mistry S, Hamdy S. The influence of chemical gustatory stimuli and oral anaesthesia on healthy human pharyngeal swallowing. Chem Senses 2005;30:393-400. Dodderi T, Kunwar S, Mathew B. Contribution of different taste on 100 ml water swallow test. J Laryngol Phon Surg 2016;6:27-31. Simons CT, Dessirier JM, Carstens MI, O'Mahony M, Carstens E. Neurobiological and psychophysical mechanisms underlying the oral sensation produced by carbonated water. J Neurosci 1999;19:8134-44. Sdravou K, Walshe M, Dagdilelis L. Effects of carbonated liquids on oropharyngeal swallowing measures in people with neurogenic dysphagia. Dysphagia 2012;27:240-50. Newman L, Armstrong R, Rogers T. The effect of carbonation on sensory dysphagia in the pediatric population. Dysphagia 2001;16:146-50. Krival CR. Effects of Carbonated vs. Thin and Thickened Liquids on Swallowing in Adults with Neurogenic Oropharyngeal Dysphagia. Unpublished Dissertation. University of Cincinnati; 2007. Perlman AL. Dysphagia in stroke patients. Semin Neurol 1996;16:341-8. Shaker R, Belafsky PC, Postma GN, Easterling C, editors. Principles of Deglutition: A Multidisciplinary Text for Swallowing and its Disorders. New York: Springer; 2012. Miller AJ. The neurobiology of swallowing and dysphagia. Dev Disabil Res Rev 2008;14:77-86. Pelletier CA, Dhanaraj GE. The effect of taste and palatability on lingual swallowing pressure. Dysphagia 2006;21:121-8. Logemann JA, Pauloski BR, Colangelo L, Lazarus C, Fujiu M, Kahrilas PJ, et al. Effects of a sour bolus on oropharyngeal swallowing measures in patients with neurogenic dysphagia. J Speech Hear Res 1995;38:556-63. Pelletier CA, Lawless HT. Effect of citric acid and citric acid-sucrose mixtures on swallowing in neurogenic oropharyngeal dysphagia. Dysphagia 2003;18:231-41. Belafsky PC, Mouadeb DA, Rees CJ, Pryor JC, Postma GN, Allen J, et al. Validity and reliability of the eating assessment tool (EAT-10). Ann Otol Rhinol Laryngol 2008;117:919-24. Nagy A, Steele CM, Pelletier CA. Differences in swallowing between high and low concentration taste stimuli. Biomed Res Int 2014;2014:813084. Hughes TA, Wiles CM. Clinical measurement of swallowing in health and in neurogenic dysphagia. QJM 1996;89:109-16. Lederle A, Hoit JD, Barkmeier-Kraemer J. Effects of sequential swallowing on drive to breathe in young, healthy adults. Dysphagia 2012;27:221-7. Veiga HP, Fonseca HV, Bianchini EM. Sequential swallowing of liquid in elderly adults: Cup or straw? Dysphagia 2014;29:249-55. Mistry S, Hamdy S. Neural control of feeding and swallowing. Phys Med Rehabil Clin N Am 2008;19:709-28, vii-viii. Sciortino K, Liss JM, Case JL, Gerritsen KG, Katz RC. Effects of mechanical, cold, gustatory, and combined stimulation to the human anterior faucial pillars. Dysphagia 2003;18:16-26. Chandrashekar J, Yarmolinsky D, von Buchholtz L, Oka Y, Sly W, Ryba NJ, et al. The taste of carbonation. Science 2009;326:443-5. Krival K, Bates C. Effects of club soda and ginger brew on linguapalatal pressures in healthy swallowing. Dysphagia 2012;27:228-39. Kim UK, Breslin PA, Reed D, Drayna D. Genetics of human taste perception. J Dent Res 2004;83:448-53. Liem DG, de Graaf C. Sweet and sour preferences in young children and adults: Role of repeated exposure. Physiol Behav 2004;83:421-9.